White Flowering Dogwood Trees are probably one of the most widely recognized spring flowering tree variety with its striking white blossoms that arrive before the tree is even in leaf. A native tree, Cornus Florida, is an all season tree with its spring blooms, summer leaves, fall foliage and winter berries. Plant your tree as a specimen, street tree or plant three or more trees in a cluster planting to create a really dramatic effect. This medium grower is a low branching tree that spreads horizontally and has a semi-rounded top. Does best in sun to part shade. Dogwoods are deciduous trees growing best in well-drained acidic soil with sufficient organic matter. Mulch to maintain a cool, moist soil. May need water during hot, dry summers. 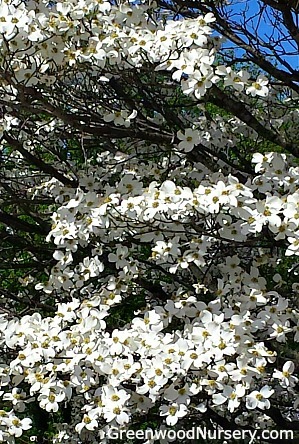 The White Flowering Dogwood is one of the showiest native trees. Growing to 20 to 25 feet tall with a 20 to 25 feet spread, the flowers of this small flowering tree unfold from the round gray winter flower buds before the leaves come out. The white flower bracts are showy and often thought to be the petals of the flower. The fruit of the flowering dogwood tree is a bright scarlet, relished by birds, squirrels, and other animals, which often eat the fruit, which matures usually between September and November. The wood is hard, heavy, strong, very close-grained, and brown to red in color.